I like the feeling too (probably because i made it back in 1994). Doesn't stand out as a classic, though it was an extremely good intro for its day. 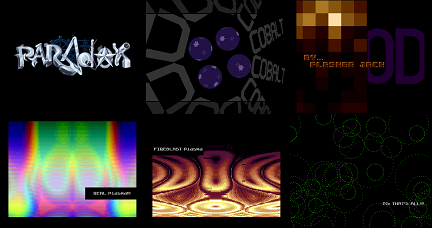 One of the first (if not the first) 64k intro that used long boring precalc to render gfxs (like the rounded letters, plasmas textures and so on) to minimize filesize as it is seen nowadays in 64k intros. I thumbed it up previously because i was quite surprised to see it here almost ten years after, quite pleasant. Btw, REAL = Really Easy And Lousy. Rocks! A clean design, a catchy chiptune and some nice effects (I love the one on the screenshot). Only got to see it today, 13 years after its release. Still enjoyed it, so it must rule! Like that one, nice code by FlasherJack! Awesome logo by Acid! rulez added on the 2010-03-03 17:35:50 by ɧ4ɾɗվ. Great little demo with nicely done effects. well thats pretty damn cool! Very good and solid production. Looked great 20 (?...goshhhh! time flies faaast....) years ago and looks the same today. Looks cool, nice scenes, music is fine. page created in 0.016542 seconds with 15 queries.